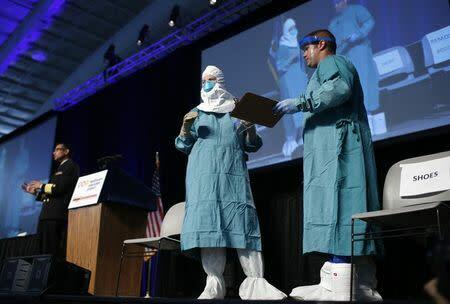 WEST HAVEN, Conn. (Reuters) - Connecticut placed six West Africans who recently arrived in the United States under quarantine for possible Ebola exposure, a move that comes as the United States starts new restrictions on those coming from the countries hardest hit by the deadly virus. The family of six West Africans, who arrived Saturday and were planning to live in the United States, will be watched for 21 days, Connecticut state health authorities said Thursday. Officials have yet to say where the family came from. 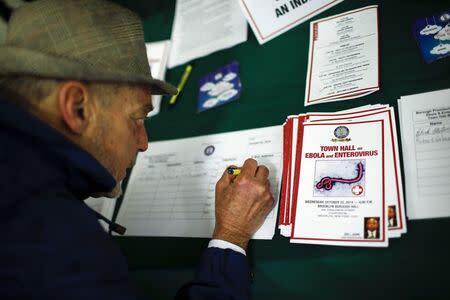 Fears about the spread of Ebola, which has killed nearly 4,900 people largely in Liberia, Sierra Leone and Guinea, have surmounted in the United States since the first man diagnosed with the disease was hospitalized in Texas late in September. He died on Oct. 8, after 11 days of care. Numerous local health authorities have launched similar quarantines or watches on those who have been to Ebola-hit countries, though no other infections have been found through these measures. The virus is spread through direct contact with bodily fluids from an infected person and is not airborne. The crisis is forcing the U.S. healthcare system to consider withholding some medical interventions because they are too dangerous to doctors and nurses and unlikely to help a patient. Officials from at least three hospital systems interviewed by Reuters said they were considering whether to avoid some procedures or leave it up to individual doctors to determine whether an intervention would be performed. Two nurses at Texas Health Presbyterian Hospital were infected with the virus after treating Liberian national Thomas Eric Duncan, who contracted the disease in West Africa and was the first patient diagnosed with Ebola in the United States. The cause of their exposure has not been determined but the U.S. Centers for Disease Control and Prevention (CDC) has said that intubating the patient and giving him dialysis may have increased the risk of spreading the disease. The CDC said on Wednesday that 66 people, who are thought to have had contact with Duncan, have cleared the 21-day monitoring period after showing a clear bill of health, while another 108 were still under surveillance. One of the infected nurses, Nina Pham, is in good condition at a National Institutes of Health hospital in Bethesda, Maryland. The family of the other nurse, Amber Vinson, said in a statement Wednesday that health officials were "no longer able to detect virus in her body." Ebola fears have also touched one of the world's most reclusive countries, North Korea, which will bar entry to tourists from Friday because of worries over the spread of the deadly virus, tour operators told Reuters. 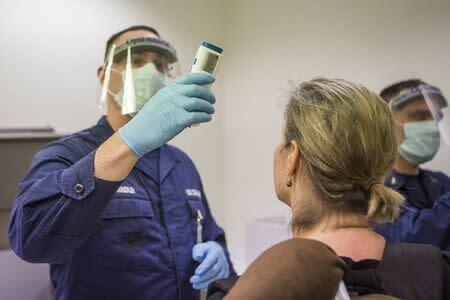 From Wednesday, travelers to the United States from Liberia, Sierra Leone or Guinea were being funneled through one of five major U.S. airports conducting increased screening for the virus. Six states account for nearly 70% of all travelers arriving from the affected countries: New York, Pennsylvania, Maryland, Virginia, New Jersey and Georgia. The new monitoring will begin in those states first and will be expanded to other states.